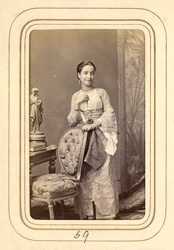 Full-length carte-de-visite portrait of a young lady wearing an exotici mixture of eastern and European clothes. The inscripiton indicates that she comes from a Jewish merchant community which felt happier in the business environment of the day in adopting a Christian veneer, in this case an Armenian one, since the Armenians had been present as merchants in India for many centuries and were generally accepted by the European community in Calcutta. The portrait is one of a series of prints of ethnic types and occupations taken by Bourne and Shepherd in the early 1870s. These photographs represent a common theme of traveller’s memoirs and diaries during the period of Colonial expansion in the latter half of the 19th century. As Europeans came into contact with other peoples there was an urge to document different races, customs, costumes and occupations. The diverse racial and cultural composition of the subcontinent became a photographic genre in its own right, due to both the rising science of ‘ethnology’ and to serve the demand for ‘exotic’ souvenirs of the east.